Unlimited number of warehouses, retail outlets, offices, accounts. Warehousing and trading operations, cash and bank operations. Advanced and powerfull discount system. 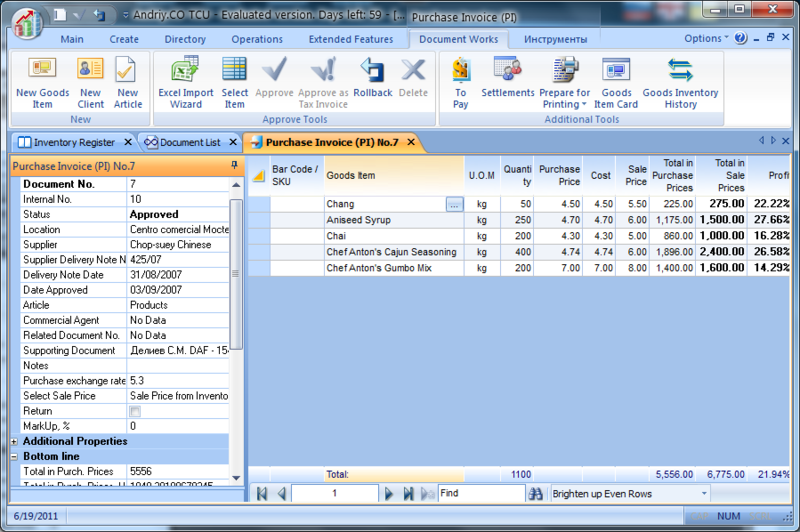 Automatic generation of Purchase Orders (PO). Mutual Settlements with Vendors and Customers. Teamwork with Pocket PC software TCUMobile. 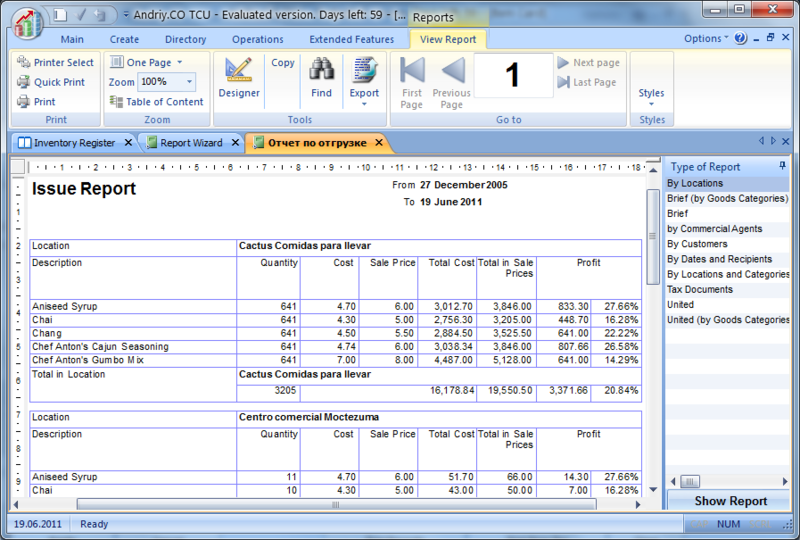 Accounting in the context of sales representatives; routes and route sheets. Planning and financial analysis and more others. Use: from the individual entrepreneur to the supermarket chain, from food to household appliances Wholesale and retail trade. 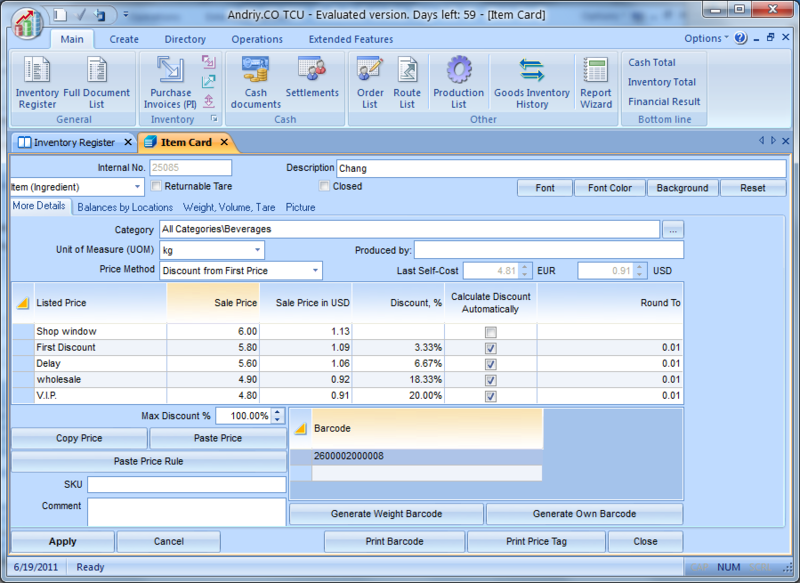 Trade Control Utility is ANDRIY.CO flagship product. 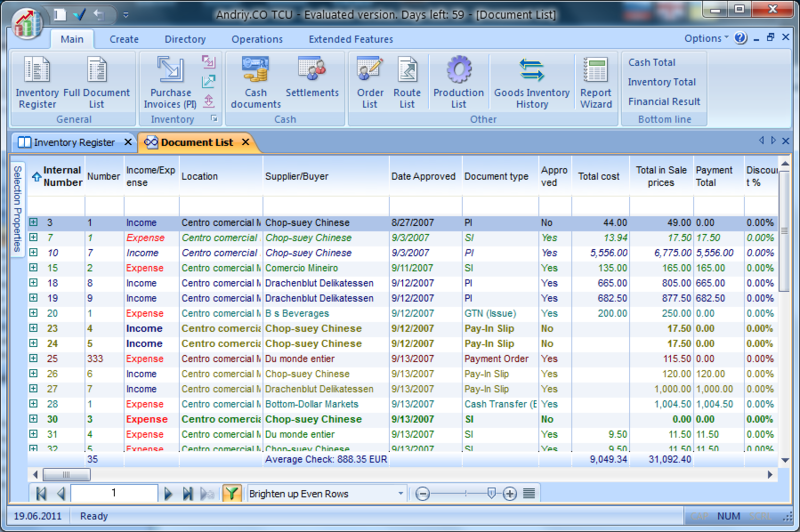 If you are looking for business accounting software - you find it. Thousands of people worldwide use TCU as the foundation of his success. What Trade Control Utility differs from other accounting systems? ANDRIY.CO developers went to this system for many years. Trade Control Utility - it is the result of hard work of talented, creative people. TCU can solve your immediate tasks. TCU contains nothing superfluous. The program interface as simple as possible and make the most pleasant. He does not need to learn. Just start the work. You might wonder how easy it can be difficult things. Simplicity and convenience are always nearby. Adding the good items to the Sales Invoice, creating Customer Order, move goods to reserve or verify mutual not be anyone working for you. Everything is done as quickly with possible minimal action. TCU tracks for operator actions in real time, and not allow to destroy data integrity. Automatic Backup will allow you to not worry about the reliability of the preservation of your information. The data is automatically set aside as often as needed. The combination of powerful algorithms and advanced technology to achieve exceptional performance. Large volumes of data are processed without any loss of speed. Operations are carried out as quickly as possible. "Trade Control Utility" has developed a means of differentiation of access rights. Each operator can be given only the necessary amount of information. The rights for the operation of configuring the maximum length for the education chain of mutual control, where staff are in control of each other. This scheme has proved most reliable. TCU maintains a detailed log of all actions of the operator with an accuracy of seconds.
" 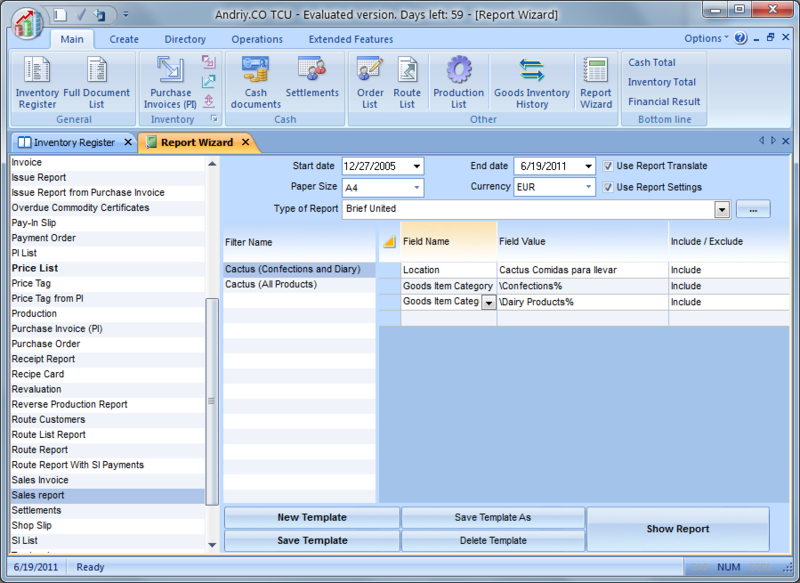 Reporting wizard " will enable you to make individual settings for each report. A flexible system of screening and filtering of data is unique in its ease and simplicity. Ability to save templates make the reporting system TCU unique and inimitable. Trade Control Utility - a dynamic system. ANDRIY.CO responsive to all requests from users. That is, users will ultimately determine the further development of the system, its capabilities, its appearance, its comfort. Since the system user receives a subscription for a year with the right of free installation of the latest updates TCU. Support ANDRIY.CO will provide real assistance in complex matters, provide competent and quality advice. 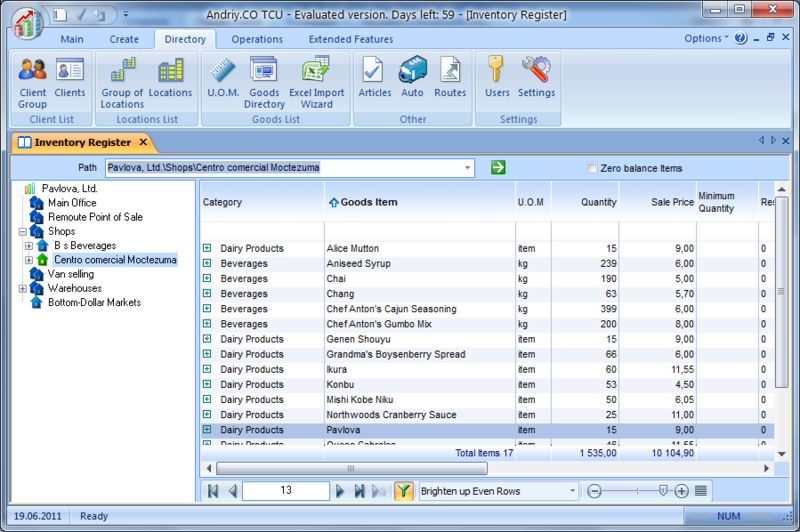 System Trade Control Utility presented in five editions. TCU Start - is a start-up absolutely free edition. Contains main features for business accounting. Recommended for home or start-up businesses. TCU Standard contains modules stock of , of money and mutual clients . Recommended for accounting for one outlet, shop or warehouse. From this edition and higher you can use TCU by network from different workplaces with one database. TCU Evolution further includes the possibility of accounting for an unlimited number of stores, points of sale and retail outlets, with the possibility of internal movement of goods and money . Recommended for use in small networks of shops, stalls, warehouses. TCU Network recommended for consideration in supermarkets, supermarket , with a large stock of goods, with large and very large sales, with a large number of documents and an extensive client base. Much attention is paid not only productivity but also the reliability of the system, automatic backup of data on a designated schedule. TCU Network supports the work with databases and Microsoft SQL Server. TCU Ultra - are recommended to use in the large holdings with developed complex hierarchical structure of units. 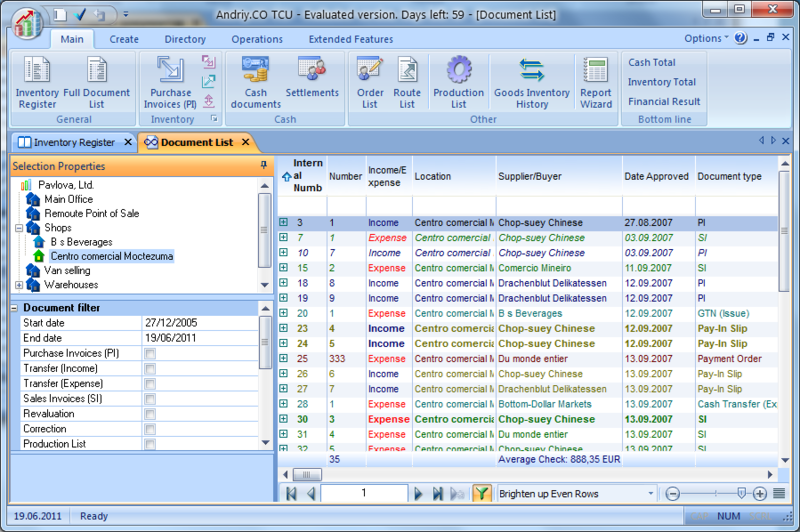 Includes all features of the project Trade Control Utility. Compared with TCU "Network" have a logistic subsystem. Able to interact with a sales agents in real time through the internet TCU Mobile application.